A few months ago I was invited on an outing to see some cricket. Since I’m not into cricket, I declined the offer. Then someone explained that “watching cricket” actually just involves lots of drinking, so I obviously accepted. It’s now 19:00 on a Sunday evening. We’ve been awake for around twelve hours and have been drinking alcoholic beverages for approximately eight of those, some since before 9:00! It’s been raining all day too, which means we’ve seen no cricket whatsoever (except for some old highlights they showed on TV). Are we bothered? Not really. We’ve had fun, cricket or not. Why didn’t they put a few more carriages on our train from Sheffield to Leeds when they knew it was going to be packed like it is every year because everyone’s going to watch the cricket? Why didn’t they build a roof over the stadium when they knew that they were building it in the North of England where it will obviously rain whenever a test match is scheduled? Why does Coco Smiley McRiley keep denying his Scottish heritage? Is live blogging actually a good idea when you’ve been drinking all day? This band was the reason we were at the Boardwalk. When they sent me a friend request on MySpace quite a while ago, I had a quick listen and thought they sounded pretty damn good so I added their gig to my calendar. This was their “Homecoming Gig” as they’re a Sheffield band who hadn’t played in the city for seven months or so. DWL (as their friends call them) have a pretty decent following in Sheffield and it’s obvious why; great stage presence coupled with tight, catchy, powerful melodies and riffs that sound great and deserve to be alongside all the other popular indie rock guitar bands in the charts at the moment. And according to one of the reviews on iTunes, they’ve already supported Snow Patrol. If you want to hear them for yourself, you can download some of their tunes from their website or buy their latest double A-side single The Start of the End Begins / Still I Think What I Think from iTunes – and it goes without saying that I’d definitely recommend catching them live at one of their upcoming gigs. At the “Searchology” press conference that was just held by Google, Marissa Mayer made several important announcements regarding the future of search at Google. First of all, Google are updating their infrastructure and algorithms to integrate all their different search engines into one single Universal Search experience. To start with, this will include results from Book Search, Blog Search, Image Search, Local, News and Video. Using the video example, we saw an interface that seemed to be an extension of their PlusBox feature, showing how they plan to embed videos directly in the search engine results page, just as Ionut Alex. Chitu spotted earlier today. According to Marissa, this is currently only live on some data centers at the moment but should be rolled out to all data centers tomorrow. Marissa explained that this bar will show its “nearest neighbors” – meaning that when you’re on different pages, you’ll see different links. For example, if you’re on a search engine results page, you’ll see links to Images and News, as you’re likely to want links to other search results, but if you’re using Gmail you’ll see links to Calendar and Documents instead. Personally, I’d like to see consistency across all pages – and even be able to choose my own links. Both these navigational features should be available later today. Next, Marissa unveiled a new service whereby users will be able to add experimental features to their search results – such as timeline and map views, keyboard shortcuts, left-hand search navigation and right-hand contextual search navigation – and actively give feedback to Google about your experiences. Part of Google Labs, the Google Experimental home page is now available at google.com/experimental although sign-ups won’t be live until next week. If nothing else, it’s good to see that we’ll finally know what to call these experimental features and interface tests! Another announcement that could easily have gone unnoticed was that Google will soon be launching a way to search in one language and receive results from foreign language websites translated on the fly. Cross Language Information Retrieval, as Google are calling it, will initially be launched in just 12 languages. By using their statistical machine translation technology, Google will apparently translate your search query into other languages and then search websites written in other languages using your translated query. One of the games I bought for my Wii was The Legend of Zelda: Twilight Princess. I figured it would be a good game to try out some of the different capabilities of the Wii controllers. Last Saturday, still hungover from the night before, I decided to give it a go. Three hours later, I was still stuck on the fishing task. No matter how hard I tried to think like a 12 year old (the game’s rating is 12+) I just couldn’t yank that fish out of the water – and that’s when I managed to hook one! Aimlessly dangling a pretend fishing rod in a pretend fishing pond wasn’t what I’d bought a Wii for! The following morning we had a visit from the elusive blog commenter known as “S Crayon” who wanted to see what the Wii was like. Within a couple of minutes, he had FISH ON! flashing up on the screen. A few more minutes later and he couldn’t stop catching fish! I guess this means he has a lower mental age than me or something. How else could he have done it? I was going wrong at the third stage by constantly waving my controller up and down, trying to yank the fish out of the water. I also just sat there for hours waiting for another fish to bite. Ah yes... I forgot to tell you all that I’m now the proud owner of a stupidly named Nintendo Wii. However, little did I know how difficult it was to actually find a Wii to buy! Luckily for me, I know people. And we all know that it’s not what you know, it’s who you know. So when an Argos store in Hull got two delivered, one of them had my name on it! What’s so good about the Wii? I guess the controller’s the obvious thing to mention. Waving your arms around not only makes games more interesting, but it helps to keep you fit and seems to amuse anyone who might be watching you through your lounge window too. 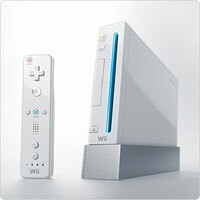 Wii Sports and Wii Play are both ideal games for learning how to use the remote in different ways. The graphics might not be breathtaking but who really cares? It’s backwards compatible with the Nintendo GameCube (not that it matters to me) and you can also buy points to download old NES, SNES, N64, Sega Mega Drive and PC games for it. If that’s not enough, you can also browse the Internet (the Opera-powered Internet Channel software is free at the moment) and the Google Reader team have even launched an interface especially for the Wii! And there’s more... If any of your friends have a Wii, you can add their Wii number to your contacts and watch their Mii mingle with yours. Since Christian managed to find a Wii, we’ve now got Mr and Mrs Briddon wandering around our TV screen in the Mii Parade. Seriously, geeks have never had so much fun! I found this completely by accident when I typed in www10.google.com which redirected to the ServiceLogin page for WWW10. I suppose WWW10 could simply mean Web 2.0 – since “WWW” means “World Wide Web” and 10 is 2 in binary – although that obviously doesn’t help explain what it might actually be. Does anyone want to take a guess? Anyway, I’ve added it to my list of growing Google Account Service Names which now includes several services that are yet to be named, including fiji, gam, rs2, ssd, weaver and wf.